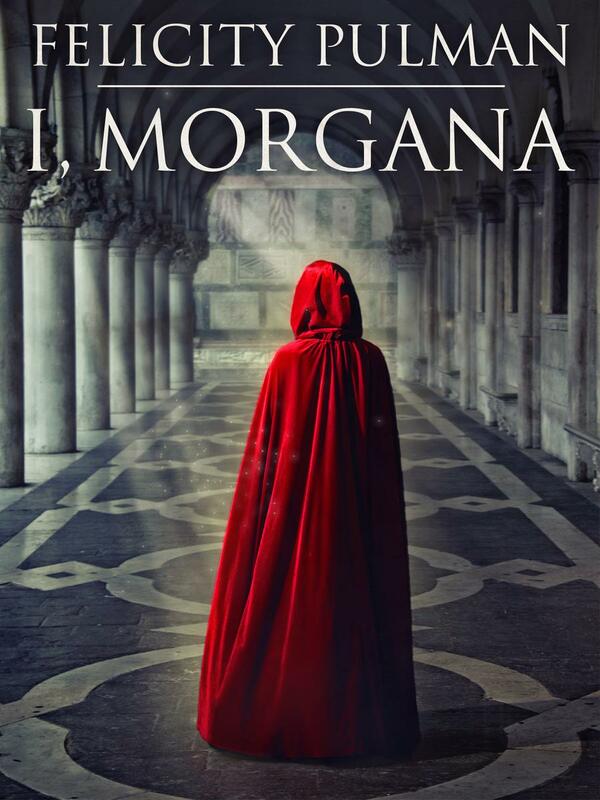 comes a new story of Morgan La Fey, of one of the most enigmatic—and reviled—characters in Arthurian legend. I am an old woman now. My bones creak and scrape together like bare branches in a winter wind. I ache with longing for my youth. When I notice my reflection, I am aghast at the vision of the hag who looks back at me. I mourn the passing of who I was, and everything I could have been. More than anything, I long to reverse time. Throughout the years I have tried and tried to do this, without success. Now, even my most potent spells and incantations cannot transform me into the young woman I once was, with all my life still to live. With age, my magical powers have all but deserted me. Once I was desired by men; now I am disregarded by all and loved by none. And I ask myself: How has it come to this, when once the future looked so bright and full of promise? And I swear a sacred oath to the gods, whoever they may be, that if only they would grant me my life anew, along with the wisdom I have learned so painfully, I would not make the same mistakes again. I would not lead us all to destruction. But the gods are deaf to my prayers and to my promises. All I can do now is call for parchment, cut my quill, and tell my story. I shall start at the beginning, because that’s when the first seeds of doom were sown: when I was a child and believed I had the power to make the whole world new. “Look at me, Merlin! Look at me.” I twirl and twirl, giddy with delight, bubbling with laughter as the earth turns around me and my hair flies into my eyes. I close my eyes and I try, I try so hard, because I know how much it’ll please Merlin if I succeed. Around and around I spin, the world gone dark around me, the air swishing past. I think it. I will it with all my heart, my mind, my soul. Something shifts. Something changes. The air feels cool against my cheek, my black feathers ruffle in the breeze. I look down as a little girl dissolves into light and shadows, and I know that I am free! Merlin knows it too. I can see him down there, shading his eyes from the sun as he stares up at me. I feel such exultation, such triumph, I could almost burst. I am Morgana, Merlin’s raven, and I have the whole realm in my power. All that I can see below me will be mine one day. I know that’s true because my father has willed it, and Merlin has promised me. He’s waving at me now, beckoning me to come down, for I have proved myself to him. But I am gone beyond him. I am intoxicated with joy, with the sensation of flying and the knowledge that at last I have unlocked the secret to shape-shifting. Now I can escape from my earthbound body and become anyone or anything that takes my fancy. And so I fly on, for the first time able to look down on the land that one day will be mine, and on the people over whom I shall rule. Beyond the spit of land on which our castle stands is the dark blue ocean, buffed into sharp waves by a brisk wind. It’s a ragged coastline of jagged cliffs, marked by the foam of breaking waves at their base. The sea hides a multitude of broken dreams, ships coming close to harbor but caught by waves and tide instead, and torn to pieces on the cruel and unforgiving rocks below the surface. Bells ring out as I fly over the abbey. Obeying their urgent summons, the monks of Tintagel hurry to Mass in their great stone church with its cross at the summit. In my bird’s mind I pull a human face at them, for their love of the Christ is not for me. I put my trust in Merlin’s magic, not the will of the god they worship. On a whim I fly onward, to the place where my father died in battle, for I have never been allowed to see the place where he fell, just as I was not allowed to see his dead body, nor was I able to mourn him openly, as a daughter should. Once I come to the battlefield, I alight on a branch and look out across the bare scrubby grass that lies baking in the glare of the sun. I try to imagine how it must have been: my father’s troops trying to defend our territory against the soldiers of the High King; a battle that ended in the death of my father, Gorlois, Duke of Cornwall. My heart fills with sorrow as I recall the events that led to that moment. It all began when my father was summoned to London to pay tribute to the new High King, and made the mistake of bringing his family with him, for it was then that Uther Pendragon fell in love with my mother and she with him. I remember how awed I was by the magnificence of the High King’s palace and the presence of kings and nobles from across the southern country. We’d walked along the banks of the River Thames, my father and I, while he’d announced his dreams for my future. His words had so filled me with excitement that I’d stopped walking and faced him. I’d crossed my hands over my heart and sworn an oath that I would never let him down, and that I would do all that he asked of me, and more. My father had laughed then—not at me, but with relief, because he knew that I understood the gravity of his charge. And I saw the love and pride that shone in his eyes when he presented me to Uther, the High King, as his heir. But there are other things I remember about that time. How Uther followed my mother, Igraine, around his court, seizing every opportunity to take her hand and press it to his lips for a lingering kiss. At the time I’d thought it a mark of his respect for us, but later I understood that Uther loved my mother. I also remember the growing tension between my father and mother that culminated in a bitter quarrel and led to our hasty departure from London. Just six months after that, my father is dead and my mother remarried. I shake my glossy feathers into smoothness, as if I could at the same time shake myself free of memories. Conscious of time passing, I look out over the battlefield once more, and mouth an anathema against the man who caused my father’s death. Then, with some trepidation, worried I may have lost the knack of it, I launch myself off the branch. I spread my wings and my body lifts up into a current of air that will blow me toward the forest and Merlin. My flight takes me over the castle and I look down at its inhabitants, tiny as ants as they swirl in patterns around the courtyard, going about their business. I fly closer so that I can see them more clearly, for I am intrigued to find out what people might do, how they might act when they believe themselves unobserved. I see my mother, and my heart catches in my feathered breast. She is sitting in her private arbor. With her is Uther Pendragon. As I watch, he places his hand on her stomach and leans over to kiss her cheek. She laughs, and puts her hand over his—and I realize the significance of what I see. Looking at them now, at the way their joined hands stroke the curve of her belly, I understand that soon I shall have yet another rival for my mother’s love. How I hate Uther Pendragon! I hate him for the way he took my father’s place so soon after he was killed. That he loves my mother beyond reason, I have no doubt. But I blame him most bitterly for my father’s death in battle and for seizing our kingdom. I also blame him for taking my mother away from me. These days she has eyes only for him. death, and that’s what I would learn from him. A sudden thought strikes terror into my heart: What if my mother bears a son, what then? I fly back to Merlin as quickly as I can and, as soon as I’ve transformed myself, I question him. I take comfort from Merlin’s words, for they justify my father’s trust in me. But Merlin has not yet finished. “Of course I shall do everything you ask, Merlin.” I am so grateful for the mage’s reassurance of my destiny that I will promise him anything. I am also grateful to have escaped a long lecture. Although I love Merlin, and will do anything to please him, I do hate it when he’s cross with me! Merlin is something of a mystery to me. He has power, I know that—the power of a mage steeped in magic—yet he is not a member of our court. My mother has become a devout Christian since marrying Uther, and anything to do with the occult has been banned. But Merlin and I have always met in secret, right from the very first when, by chance, I escaped my nurse and my sister, and ran into the forest beyond the castle looking for adventure. Merlin found me—or perhaps he knew I would come that day and so he waited for me? I know not, but since then we have always met in the forest, and I have told no one about what he is teaching me. He looks a bit like an elderly owl, with tufty white hair and piercing eyes that seem to see right through me. I know that he believes in me, for he cares for me as a father would. And I try to please him in everything, for there is much I can learn from him, lessons I need to understand if I am to fulfill the shining destiny he has promised me. I am determined to do well, to be the best. I am determined to justify his faith in me, and fulfill the oath I swore to my father. After Arthur is born, I wonder why I ever felt such hatred toward him. He’s the sweetest thing I’ve ever seen, smiling up at me and gurgling with joy whenever I come into the room. I cuddle him when he is fretful, and at night when he’s going to sleep, I sing him into the dark. In every way I try to give him the love and comfort we both need, to compensate for our mother’s preoccupation with Uther and her indifference to us. I’ve come to resent Igraine, and I hate her new husband. But my heart has been stolen by this child, who loves me without reserve just as I love him. As Arthur grows older it becomes increasingly difficult to leave him behind when I meet Merlin. I am fearful that he might innocently betray my secret, but my usually placid and biddable little brother puts on such a tantrum when I try to get away that I eventually relent. Once begun, I continue to bring him with me, all the time warning him that I’ll cut out his tongue if he ever says Merlin’s name. Even though I have no intention of carrying out my threat, Arthur believes me and so, whenever he sees Merlin, he sticks out his tongue and slices his finger across it. And I smile and nod, and give him a cuddle to compensate for scaring him. Arthur follows me everywhere, trying to copy whatever I’m doing, often with amusing results, especially when it comes to magic. Shapeshifting comes easily to me now but not to Arthur. At first he rolls himself into a little ball and squeaks like a mouse, really believing that’s what he is. He tries so hard, but he keeps crashing into the wall when he attempts to run down a mouse hole. Finally he catches his hand in a mouse trap while trying to steal a piece of cheese—a painful lesson for him! He’s not much better at transforming himself into a rabbit either, even though he keeps trying. I must admit I enjoy showing off to Arthur, who is always impressed and who always begs for more—even when I once turned myself into an irritating fly to torment him! Sometimes I become a pet for him to play with: a puppy, a pony, a cheeky monkey full of tricks. Sometimes I secretly help him perform magic, just to see the joy on his face when he thinks he’s able to do what I can. And I pretend that his favorite cloth rabbit can talk, although I often need to hide my mirth when Arthur confides in his rabbit without seeming to realize that he is also confiding in me. But speaking as Arthur’s rabbit gives me a further opportunity to comfort him if comfort is needed, and to gently guide him in the ways of the court. Keeping Arthur amused with my magic tricks is more important to me than obeying Merlin’s exhortations to use magic sparingly, and only when necessary. On one occasion, I transform myself into a raven and ignore Merlin’s cries to come back. I swoop down on my mother and Uther, circling closer and closer, avoiding their flailing arms until I manage to deposit a dropping on Uther’s head. How sweet that moment is! What pleasure it gives me! But my pleasure turns sour when Merlin begins his lecture. “The knowledge of magic is dangerous when used without wisdom,” he warns. How can he accuse me of lacking wisdom when I’m always so quick to learn whatever he teaches me? I’m so annoyed that I flounce off, even though Merlin has promised to initiate me in the use of sacred herbs and their magical properties. Then Arthur tells me Merlin has started to teach him magic, really teach him magic instead of just letting him watch and play at it, so I give Merlin a pretty apology. He says he’s glad I’ve come to my senses and we go on as usual, with one difference: Arthur is part of the lessons now. Not that I mind, not really. I’m so much better and so much quicker at everything than he is. Nevertheless, I listen carefully, and practice until I have perfected each new challenge. But it worries me that Arthur is becoming closer to Merlin. I know I am Merlin’s favorite, his most gifted pupil. As much as I love my little brother, I intend to keep first place in Merlin’s heart, always. Merlin has told me that one day he hopes he will be able to teach me how to traverse time, although he warned me, with a cackle of laughter, that he, himself, has been unable as yet to master the art. I’m excited by the possibilities; I dream of what I might achieve, determined as I am to go beyond Merlin’s abilities and do what he cannot. My ambition is to turn back time; to keep my beloved father safe and the usurper, Uther, out of my mother’s bed.